Over the last few weeks I’ve been testing (with some help from our very own Ghostrider, whose profoundly enlightening viewpoints will be revealed later on in this post!) the Virtue Encore 5M from Virtue Bikes. 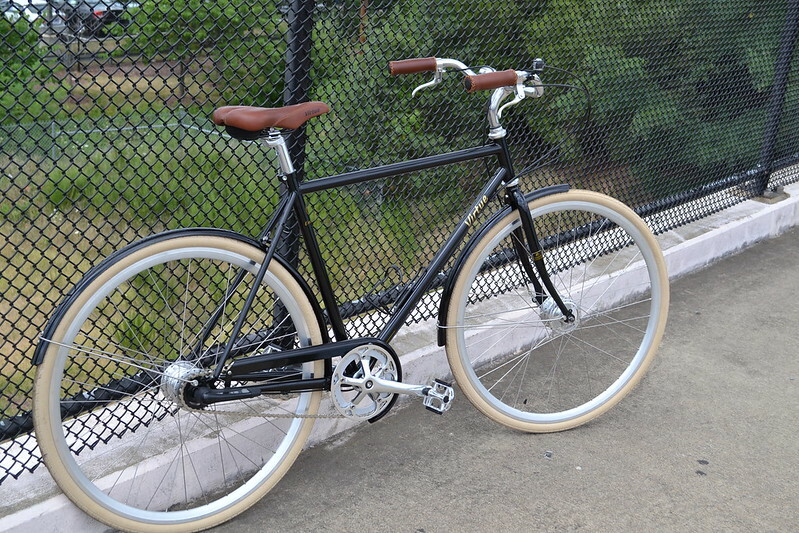 Virtue is a San Diego-based company offering stylish city and transportation-oriented bikes at affordable price points. 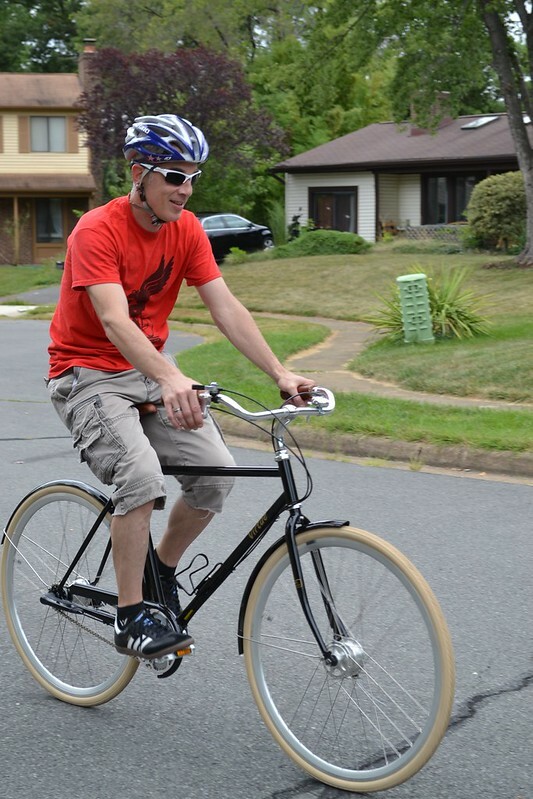 The Encore 5M is their standard men’s frame with a 5-speed Sturmey Archer hub. Google+ auto-edits FTW! This bike looks right at home in an “old” photo. Right off the bat, this bike gave me some difficulties… on my first ride, the rear hub locked up suddenly and I almost got dumped in a ditch! Thankfully I had only gone a quarter mile from home… but after inspection, I was unable to determine the issue with the hub. My LBS took a quick look at it, and advised me to request a new wheel from Virtue – so I did, and a few days later I got the new wheel. After a couple weeks delay on my end (family vacation etc.) I was able to install the new wheel (though with a little grumbling as the new wheel was sans rim tape and I had to install my own “rim tape”). A few more tweaks, and it was finally ready to ride! Where is my hand supposed to go?? Yeah. So I fixed that. Nothing too tough… just required moving things around a little bit. The way I’ve got it now still looks fine (IMO) but is actually functional, and allows me to put both hands on the bar! This type of issue, where looks trump function, seems to extend through some of the component choices on the rest of the bike. 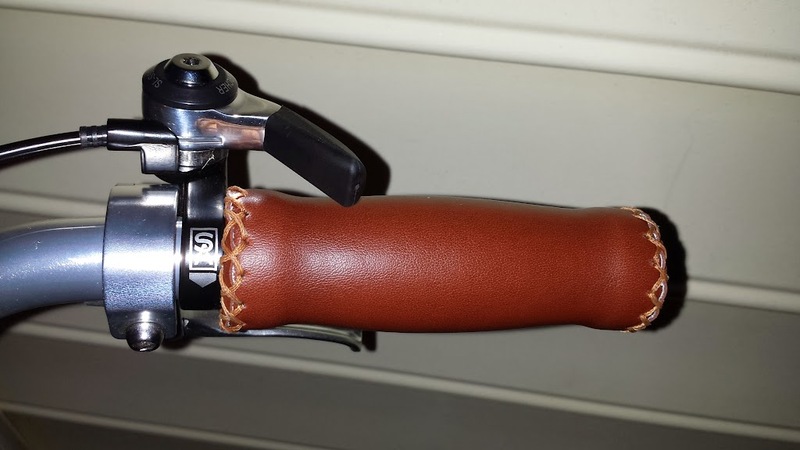 The grips look great, but the cushion is really soft, so after a few miles my hands were getting uncomfortable because of the pressure from the bar. Maybe I just have wimpy hands… but I don’t usually have that issue. Similarly, the saddle looks nice, but after about 5 miles on it various parts of me start to go numb! Not cool! Finally, the flat pedals are single-sided; they look nice, but there’s not really a good excuse to have ones that aren’t double-sided on a city bike. Looks are deceiving, this is painful! All of that said… the bike itself rides pretty nicely. The (chromoly) steel frame absorbs bumps the way you’d expect it to, and the 700×32 tires give enough cushion to smooth out small bumps – which is good, because I think that’s about the max volume tire you can fit in this frame (for the rear at least) – I had to deflate the tire to get the new rear wheel on, and the clearance between the tire and the fender is pretty minimal. 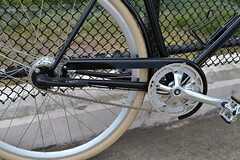 The Sturmey Archer 5-speed internal is a nice touch for gearing – that range covers pretty much anything I’d want in a city bike. I will caveat that I never got the shifting to work exactly as it should, but I’m going to put the blame there on my lack of experience adjusting internal hub shifters. I would assume that if this came from a shop, it would be properly adjusted and work nicely. The drum brakes worked pretty nicely too. I tend to prefer the most powerful stoppers I can get, and that’s definitely not drum brakes, but I was able to stop in reasonably short distances with these – pretty comparable with a lot of road-style rim brakes. Having an internal hub shifter and drum brakes makes for simple lines and simple maintenance – but there is one negative to all of that, which is that if you get a flat while riding this, you’re probably not fixing it right where you are. That is, unless you’re packing (for the front) 15mm and 17mm box wrenches, or (for the rear) 15mm and 10mm box wrenches and a philips screwdriver. This of course is in addition to the normal flat-fixing tools! Not really an issue specific to this bike, just something you might want to be aware of if you haven’t thought about it! So what do I think of the Encore 5M? Well, in the end I think there’s a pretty reasonable platform here that could be made better with some judicious part swaps. If this was my bike, the previously mentioned grips, seat, and pedals would all get changed out right away – some of that is personal preference of course, though I happen to think my opinions are very reasonable! I’d definitely change out the stem too. The handlebars are pretty close in, resulting in a riding position that’s very upright and occasionally knee-endangering. I think a slightly longer stem would help there. Also, the current stem and bar combo seems less than ideal – I had trouble tightening the bolts down hard enough to prevent bar rotation. In the end I got it where it won’t rotate most of the time, but I can’t tighten it any further because I was starting to strip out the bolts. I’m not sure if that’s a matter of component quality or just making sure the stem/bar are an ideal fit – but I’d want to make it better, and a new stem would likely do the trick. I’d definitely want to add a rear rack (there are spots to mount one). It would be nice to have a kickstand too – which some of Virtue’s advertisements say is included with the bike, but which I didn’t get with this bike (so maybe I was just unlucky?). Having said all that, none of these changes are very expensive, and I always assume I’m going to want to change out the seat (and possibly other contact points) on any bike I purchase just out of personal preference. The Virtue Encore 5M has a MSRP of $599, which puts it on the more affordable end price-wise in comparison to other bikes with steel frames and internal shifters. If you like the looks of the frame but don’t need the SA hubs, some of their other offerings come in much lower – $290-$400 for single speed and conventionally-geared bikes with up to 7 speeds. I agree with everything Matt said about the strengths and weaknesses of the Virtue. It’s a stylish machine, no doubt, and it definitely has the foundation for a really nice and versatile urban machine. However, some of the parts choices left me cold, starting with the one-sided pedals. 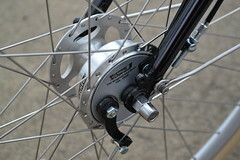 A proper citybike should have grippy platform pedals with tread on both sides so you can just get on and go. The drum brakes were better than other drums I’ve tried in the past — I definitely don’t care for them, in general, as I feel they don’t have enough braking “oomph” for my taste. I tried locking up the rear drum on the Virtue, to no avail. Still, the SA drums seemed to be a bit more powerful than the Shimano drums and rollers I’ve used previously. 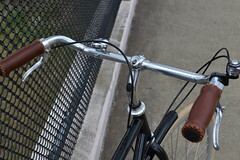 I did feel cramped on the Virtue — the swept-back handlebar and the upright stem meant putting the ends of the bars right in my lap. Getting out of the saddle to pedal became a real chore because of that…awkward and unstable. I would like a more stretched-out riding position; that would be remedied easily by a stem swap to something with a bit more extension. 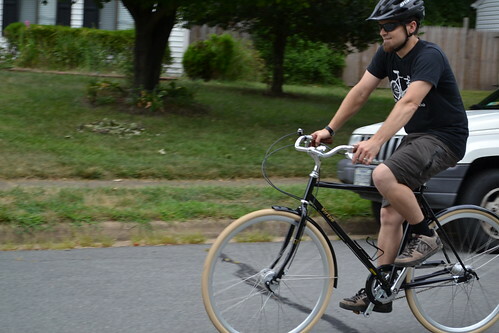 This would stretch the rider out some, but not sacrifice the mostly-upright stance such a citybike should have. 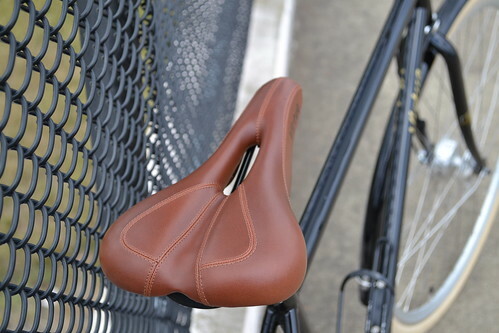 I didn’t like the saddle, either — I like a flat saddle with no cutout, and the cutout on this particular saddle felt like it was taking a cookie cutter chunk out of my nether regions. 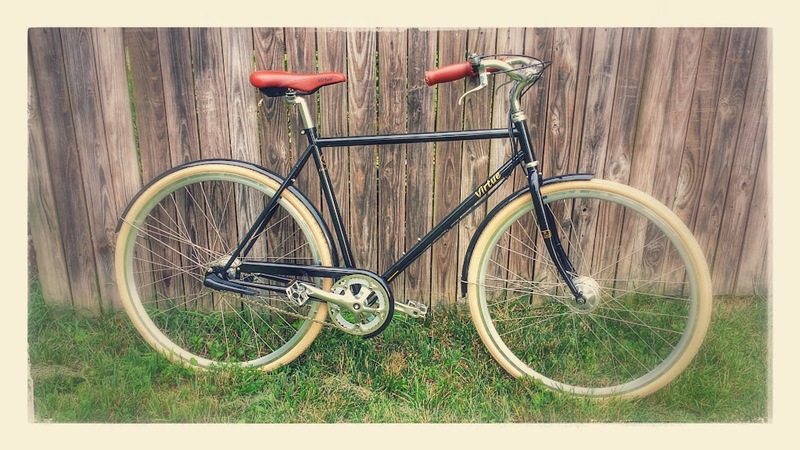 In general, I commend Virtue for putting out a line of bikes that is affordable and stylish. I can’t help but think, though, that the company is perhaps too married to their price points, and quality/component spec/overall build suffers a bit for it. None of the parts Matt and I gripe about here in this review are expensive to swap out, but I’d like the Virtue folks to take a deeper look and find more suitable parts to specify for their various bikes.